Instantmess is an online musical, a love story lived and told through online media. Here you can explore conversation logs, text messages and songs to uncover the story of something better left online. The story can be uncovered in any order, using a bit of your own initiative to find the secrets and lies of a blossoming online love. Instantmess has not been tagged yet. Help others find Instantmess by tagging it! Instantmess has not been reviewed yet. 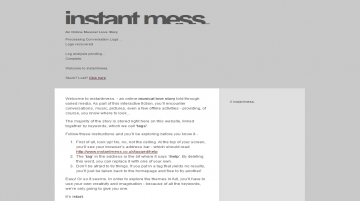 Instantmess has not been recommended yet.